Tranmere chairman Mark Palios says that ex-manager Rob Edwards rejected the offer to have former Cardiff boss Dave Jones as a mentor. Edwards, 41, was sacked on Monday with Rovers bottom of League Two, with Micky Adams taking charge at Prenton Park. Jones also coached Stockport, Wolves, Southampton and Sheffield Wednesday. "I had brought in Dave Jones and people thought he was in to come as an interim manager, but he was in to be a mentor," Palios told BBC Radio Merseyside. 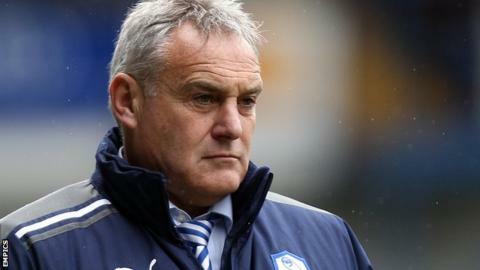 Jones has been out of work since he was sacked by Sheffield Wednesday in December 2013, and the 58-year-old had been heavily linked with replacing Edwards. Dave Jones has won promotions as a manager with Stockport County (1996-97), Wolves (2002-03) and Sheffield Wednesday (2011-12). "Dave came in and that was something we tried to make happen but in the end it was Rob's decision whether he would accept the mentor in the time frame that we talked about," added Palios. "I think that would have given him a bit more time, a bit more help with Dave Jones' extensive contacts." Edwards had only five months in charge at Tranmere in what was his first managerial appointment, following a three-year spell as a coach and then assistant manager at Exeter. "It wasn't something [the sacking] I took lightly as a decision on the basis that Rob was a good guy," added Palios. "While we still have time to rectify it, it was necessary to take action. "We've had to get another manager in and give him sufficient time and also the funds to replenish the squad."